2005 was the 250th Anniversary of Samuel Johnson’s Dictionary of the English Language published in 1755. The fifty pence coin shows part of the definition of the words '50 Pence'. 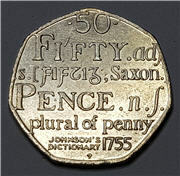 The reverse, designed by Tom Phillips show entries from the Dictionary for the words FIFTY and PENCE, with the figure 50 above, and the inscription JOHNSON’S DICTIONARY 1755 below. Mintage: 17,649,000 (may include coins issued as part of a set). Minted at The Royal Mint.